Seeing as it’s a hot topic right now, I thought I’d take a quick look at the Blackwall Reach Regeneration Project, picking out some of the more significant points. I am a signatory to the BD campaign to save Robin Hood gardens, but not for the ‘masterpiece’ reason, and the issue is not entirely black and white, of course. I think that Architects do themselves no favours by aestheticising something that has to be lived in, without a care for the residents, but the regenerators certainly have nothing like the best interests of the residents at heart. The way the reports are written are good examples of spinning the situation as something responsive to the existing residents. Everyone is to be consulted, all views will be taken into account, and of course nothing has been decided yet. A few of these tactics are detailed below. The first problem I noted is the frequent use of the word ‘local’; as in ‘homes for the local community’. This report detaches local from its temporal associations. As far as I can gather, local, in the context of the report, means anything that is present in the area. If I were to walk down there now, the report would consider me local until I walked back out. This disingenuous use of the word will form the basis of a number of examples of intellectual sleight-of-hand throughout the report, regarding relocation and influx. To be tautologically blunt, somebody buying a new penthouse in Blackwall Reach will instantly become a local, and the family forcibly removed and rehoused further east will no longer be local. – Meet the needs of eligible households including availability at a cost low enough for them to afford, determined with regard to local incomes and local house prices. – Include provision for the home to remain at an affordable price for future eligible households or, if these restrictions are lifted, for the subsidy to be recycled for alternative affordable housing provision’. The vagueness of this definition is routinely abused in the contemporary construction industry; Developers, who of course operate only at the level of the bottom line, have no interest in providing ‘affordable’ housing at below the market rate, so one often ends up with studio flats being designated as the ‘affordable’ housing in a new scheme, this of course exacerbates the problem, as these units are usually sold to the growing number of well-off single person householders that have been a large cause of the rise in housing prices in the first place. 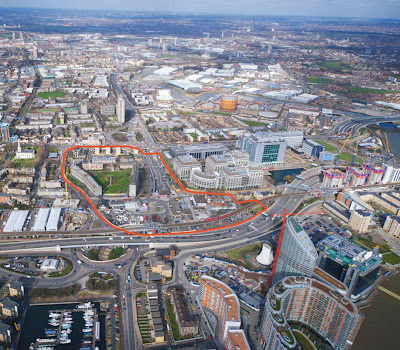 There is nothing to suggest that Blackwall Reach will be any different. Most of the report, it has to be said, makes well meaning and totally uncontroversial statements, nice, friendly and spun. Profit is referred to as ‘financial gain for community facilities’, for example. 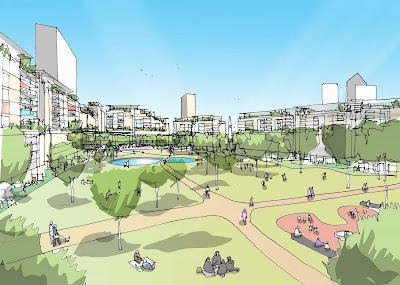 There are two development options outlined, the one retaining Robin Hood Gardens has three pros and ten cons, and the option demolishing it has eight pros and three cons. This is where spin really comes into play, as a pre-made decision is given a veneer of debate and rationality. ‘every council rented home in Robin Hood Gardens would be brought up to the Government’s basic decent homes standard (not to the same standard as new homes)’. This is barrel scraping, basically, filling out blank bits of paper in the report with what is supposed to look like consideration and evaluation. The real argument against this situation is that it is an example of class cleansing. Those who currently live in the area should have far more of a say what happens to them, but right now they have to deal with an ongoing uncertainty that is likely to result in their having to leave. Around 80% of people who responded to consultation want Robin Hood Gardens to be demolished, but the same amount want to stay in the neighbourhood, and the two are not likely to be reconciled. Every question asked about the re-housing policy meets with a qualified answer, such as ‘those who wish to remain in or return to the area have a good chance to do so.’ A good chance having nothing solid about it at all. This insecure situation is also routinely referred to as being given a choice, which of course is not the same as being free to choose. There is a density issue as well. The site currently has 252 homes on it, according to the report, and the proposals are to build up to 3000 homes on the site. If, as claimed, 35% of the new housing will be ‘affordable’, then shouldn’t it be easy to guarantee the current residents the option to remaining there? One reason that there can be no guarantees is that the council will have no houses on the redeveloped land, they are giving up their landlord status to the private sector, and they can only make suggestions to these ‘registered social’ landlords. The report states, 'people who are tenants of the council can remain tenants of the council if they wish', the word 'elsewhere' being omitted. Directly to the south of the site lies Canary Wharf, and to the north is the Olympic site. 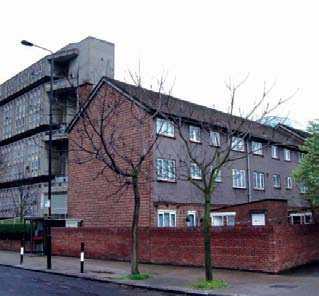 Robin Hood gardens is part of the last barrier against the spread of the City, which has now burst the dam at the Aldgate roundabout and is proceeding eastwards along Commercial Road. The Blackwall Reach regeneration would mean Docklands crossing the Highway, and then it’s not long before the East End of London begins in France. The people who already live there deserve better to be cleansed away by the regeneration juggernaut (the reports even speak ominously about a ‘right of return’ that can in no way be honoured), even if this gentrification is inevitable.